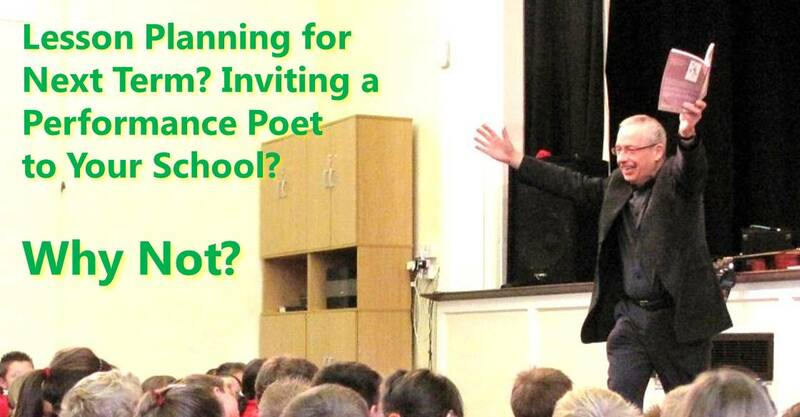 Just wanted to a say a big thank you for organising the Bernard Young poet visit and the interactive sessions with him. Both my kids have been so inspired by him and poetry isn’t something we or they have read much of so been great to show them how poetry can work. Lucy has read every poem to us out of the book she bought and loves the fact that it has been signed by him especially for her. Really lovely to see them so excited about it. Thank you, great idea. Please pass onto any other staff who have been involved in making it happen. Parent, Radcliffe on Trent Infant and Nursery School. Many thanks to you for a fabulous poetry morning! The children loved it and you have certainly inspired us adults with ideas to move our poetry topic along. It really was a very enjoyable morning and I will be recommending you to the rest of school so hopefully we will see you again! Rosalind Peacock, Meadowbank Primary School, Cheadle. We loved every minute, thanks so much – we’re all officially inspired. Rachel Robinson, Moorside Primary School, Swinton. KS2 have had a brilliant day writing and performing poetry. Thank you for your visit. We were very happy to have secured a booking with Bernard for World Book Day 2015. The children (and staff) enjoyed Bernard’s poems, especially the ones they could join in with. They were all clearly inspired by Bernard’s poetry and produced some excellent poems of their own which they shared with the whole school in lots of different ways at the end of the day. K. Jessop, Assistant Headteacher, Aldbrough Primary School. Just wanted to say a big thank-you for today,you helped make World Book day special.The children really enjoyed listening to and writing poems.I hope you enjoyed your time at St Brigid’s. Have a restful weekend after your busy week. Thank you so much for a really enjoyable day, it was a great start to our World of Writers topic. We’re going to collect all the work produced on Thursday and make a school Anthology. I loved the blog! I will be showing the children. We all had a great day and the children have been talking about it ever since. This morning we had a celebration assembly and once again they wanted to share their poetry with school. Just loved it. Thank you so much. Many thanks for the great lesson with my Year 2 class this week. They really enjoyed it and have already been practicing the poem they composed with you. We’ve never produced such a variety of high quality poems before. Thank you. Thank you so much for such an enjoyable and entertaining day. I am sure you appreciated just how much the children gained from your visit but I just want to emphasise the value of your day. We could not normally produce such high quality writing so rapidly and painlessly. On behalf of the pupils and staff may I thank you for your outstanding contribution to our theme week based on travel. The children thoroughly enjoyed your poetry sessions and you certainly inspired them. Thank you for your enthusiasm, wit and poetic talent. Thank you so much for coming to St Teresa’s school. We loved your poetry. Please please come again. Thank you for the poems, fun and inspiration. Brilliant. Thanks. Glad you enjoyed it. I had a great day in your school.